His memoirs took me on hour after hour of pleasure reading about his experiences in Provence, he will be greatly missed. We have recently learned about the death of one of our favourite authors who died last month after a short illness. He was such a talented person who brought to life the “happenings” in Provence through his book “A Year in Provence”. His depiction of the various characters he came across was masterful and of course his renovation work on his 200 year old property was fascinating. By writing this book I am sure it inspired thousands of people to visit France and perhaps to move there permanently. Sir Ridley Scott paid tribute to his friend saying,”he brilliantly captured the humorous competitiveness between the English and the French. Peter was a very kind and successful man”. Sir Ridley Scott turned one of Peter Mayle’s books “A Good Year” into a movie starring Russell Crowe, which Paul and I still watch at least once a year. Originally from Brighton, he moved to Menerbes in the Luberon hills in 1987 with his wife Jennie to escape the rat race in London. He met such characters while renovating the property that it inspired him to start to write a book in 1989, which has sold more than six million copies. A thought from Peter Mayle, “Good manners make any man a pleasure to be with. Ask any women”. The renovation of the utility room at the rear of our home in Daglan is now complet, it took a while but I am so happy with the result. As you can see from the picture below the utility room was made of steel and fibreglass, a horrible sight which sunlight light was unable to enter even in the height of Summer, leaving the utility room dark and dismal. This eyesore just had to go. First came the new roof, also fibreglass and steel that needed replacing. Paul laid down wood and fitted shingles which were a surplus from a friends renovation work. Thank you Angus they work a treat, as the last couple of nights have proven, completely waterproof. In the above picture Paul was working in the extreme 40+ degrees centigrade heat of a hot Summers day so a little shade was needed (top right). Then it was guttering and down pipe, seen here with the new wood cladding. Starting to replace the fibreglass panels and voila, we have light. What a difference it makes to be able to see in and out. Almost finished, Paul also panelled the inside of the utility room. Looking great, Our cat Cleo loves to sit on top of the tumble drier and watch the birds in the courtyard. 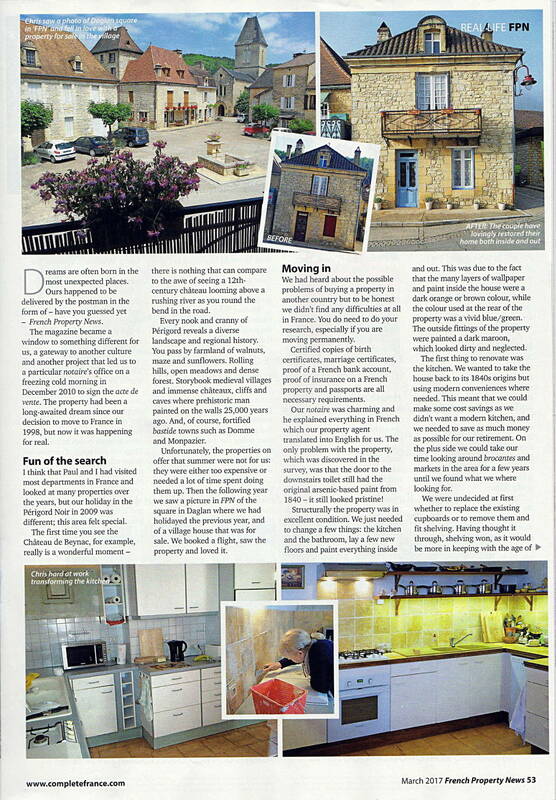 Towards the end of last year I was asked by the editor of French Property News Magazine to write an article for them about how we found our home, the buying process, the renovation work, Daglan village and the surrounding area. At first nerves took hold and I thought no, then on reading past blogs and our experiences, who could forget the arsenic paint on our toilet door, or the shower that kept me practising Yoga every time that I used it!, I thought yes I can write the article. The editor loved the article and our pictures and it was published in the March issue of French Property News magazine and now the April issue has been published I can show my article in our blog for you to read. I hope that you like it. Just click on the page image to open an enlargement in a new window (Use keys to override your popup blocker if needed). I was reminded by our son that it was one year ago today my husband, son and cats began the long drive to Daglan. I followed by plane a few days later and the year has just flown by so quickly with some ups and downs along the way, we made it here and eventually so did our furniture! When we look back over the year and through our extensive photograph collection, the pictures that mean the most to us are our pictures of the people here in Daglan, they are truly “the heart of gold.” We have meet so many new and interesting people that it is those people that stand out the most in our lives. From the very start of our new life here a warm “Bonjour” made us welcome by the doctor, dentist, government officials, the plumber and chimney sweep, our new friends who gave us lavender plants and friends that we have known for a few years thank you so much, it has been a good year. Before I start to shed a few tears here are some of our most memorable pictures from the past year. Daglan fête was a time of celebration at Le Thé Vert. The parade with our Maire in the middle of the picture, wonderful. The view from our balcony over looking the Sunday market. I so loved this steam train ride, fabulous. People here have asked me what the weather was like in Blackpool during the Summer. These are a few words that I jotted down before we left England. July in England. Billowing wind that has whipped up the many seagulls from the coast and has now drifted inland across the house tops and buildings of Blackpool. Then the sharp, stinging drizzle fell growing in strength until the grey clouds were turned into black sheets of unforgiving rain. July in Daglan. Summer gasped upon the village like the mouth of a great oven. Even in the shade of the canopy in our courtyard it was too hot for me to sit outside for long periods. This was the time of flowers, butterfly’s and moths which would glide and dance around our growing vine. We took our walk down the lane beside the river Céou to see the horses, dragon flies and lizards much earlier in the day than during the Spring time. The cries of the cicadas seemed to become more insistent with each hot day until they hit a crescendo. This was the time for barbecues, for visiting friends old and new and to sit back and enjoy our first year. Welcome to the village party, it does not get any better than this. We have completed a lot of decorating, DIY and renovation work this year, from the completely new bathroom, to the corridor floor, to painting the window frames, shutters, balcony, and veranda and much more too tedious to tell. Our next project is to focus on the rear of the property, however, a rest is in order as our son is arriving from the UK this afternoon. 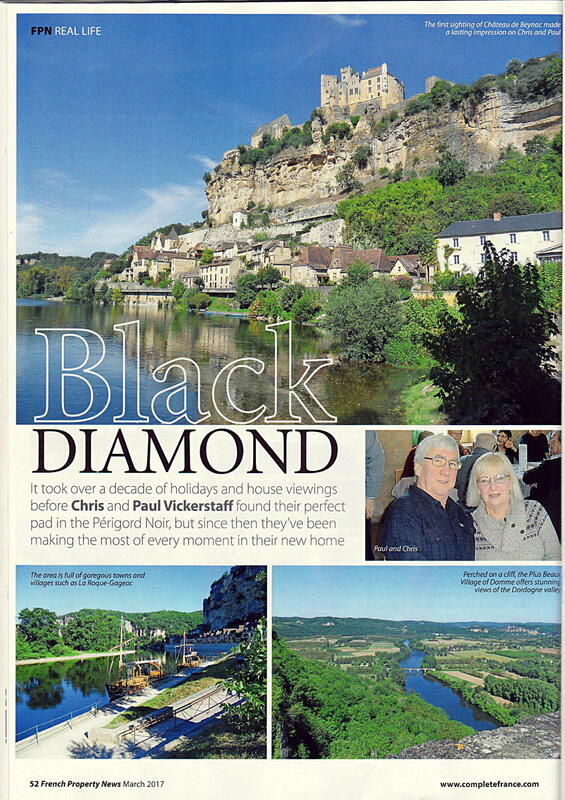 On second thoughts a rest might not be the right word, for I am sure a Cro-Magnon cave or two will be visited, canoeing on the Dordogne and we will visit our favourite medieval town of Sarlat. A final word, if your dream is to move to France but you are feeling a little trepidation, a new country, different culture and way of life. Do not let apprehension stop you, go for it, you will never look back. The French love life and so will you, Bon Courage. Problems of the undulating floor and walls of our corridor. Old property in France does seem to have the same problems, the undulating floors and walls that meander at irregular intervals. Personally I love the quirkiness of our home, it has character but not so much when you are putting down a new floor covering along the corridor which runs past the bathroom and the bedrooms. Paul measured the floor, the walls, the distance between the walls, scratched his head, and said “there could be a problem”. The corridor zigzags past the bathroom, turns left by the stairwell then right to the long stretch past the bedrooms, you guessed it, the corners are not right angles. To work, the first problem was the carpet which seemed to be stuck down with super glue. But not to be deterred Paul battled on, a centimetre at a time. The second problem was, as I stated earlier the floor which is not level but kind of slopes down to the bathroom and then undulates down the main corridor. After careful consideration and several failed attempts at laying the flooring Paul started from the centre of the corridor and then worked towards the walls. A good plan but frustrating when you lay a piece of wood down which is straight at one end and is up at the other. Another plan cut the floor boards into smaller lengths then jigsaw them together, it worked. You can see from this photograph how the corridor goes from wide to narrow and back to wide as you go towards the door to the veranda. Angel, always vigilant for a game decided to play hide and seek with the box. I thought that it would take weeks to complete the corridor but Paul had it finished in a few days, bravo. The event of the year in Daglan. We have four days of sleepless nights to come, the speakers for the music are usually placed at the corner of our home so very, very loud but on a positive note we shall certainly enjoy the parade, fireworks and the bands that play. Just hoping for rock music and we shall be happy.